KUCHING: The Development Bank of Sarawak (DBoS) is expected to be operational starting from January 1 next year. “Actually, we have formed the Board of Governors (for this bank). And God-willing, it will start operating from Jan 1, 2018 (onwards),” said Chief Minister Datuk Amar Abang Johari Tun Openg at the state-level Gawai Dayak dinner last night. 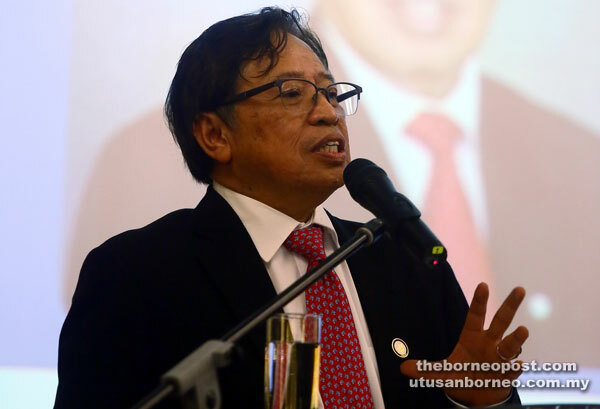 Abang Johari said it was a must for the state to have its own bank in order to accelerate Sarawak’s economic development. “With that strategic move, we can focus on our emphasis to develop the rural areas,” he said. He also announced the state government has agreed to give two pieces of land at Ong Tiang Swee Road to the Dayak Cultural Foundation (DCF) and Dayak Chamber of Commerce and Industry (DCCI). “With this (land in) strategic area that I have announced tonight, I am sure the Dayak Cultural Foundation and Dayak Chamber of Commerce and Industry will be able to play their part in expanding our economy,” he said. He was also happy the organisers chose the theme ‘Segulai Sejalai: Transformation Towards Digital Era’, which showed growing public awareness on digital economy as the way forward for Sarawak. Meanwhile, the event’s organising chairman Dato Gerawat said the Dayak community can meaningfully participate in the digital economy if the government can provide the necessary infrastructure such as road and telecommunications facilities, he added. Also present were Deputy Chief Ministers Datuk Amar Douglas Uggah, Tan Sri Datuk Amar Dr James Jemut Masing and state and federal cabinet ministers.